To further my own self-interest in keeping track of things, I’ve made a minor extension to the del.icio.us bookmarklet, so that selected text on the target page is used for the (optional) extended description of the routed item. This makes the items I route easier for me to scan. And for you too. Of course if you did the same, the items you route would be easier for you to scan. And for me too. OK, I get the gist. 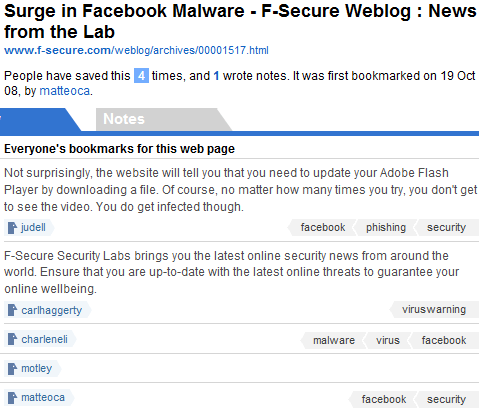 If malware and/or Facebook are central topics for me, and I haven’t heard about this already, I’ll click through. But in most cases, I’m scanning my flow to expand my peripheral awareness. I don’t have time to click through and look at everything. I need context wrapped around the items that appear in my flow. Before you invoke the del.icio.us posting form, select the text that best summarizes the item you’re bookmarking. Then paste it into the Notes field. It’s been bookmarked five times. There are two annotations. But I claim that only one of them is useful. carlhaggerty’s blurb is site boilerplate that comes from an F-Secure meta tag. It says nothing about this particular item. My blurb, however, adds useful context. It identifies the item as a Flash-related phishing exploit. 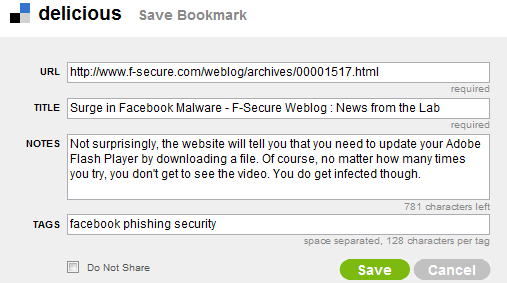 Now my subscribers can absorb, at a glance, the additional context about phishing and Flash. Their peripheral awareness expands. Their time spent scanning their flows is more productive. And their subconscious anxiety — about not clicking through to read the majority of items they can’t possibly have time to read — is alleviated. (Further update: Crap. How the hell do you defeat the “smart” single quotes at WordPress.com? The above won’t work either, but I’ve put draggable and copyable versions at http://jonudell.net/delicious-bookmarklet.html). This is a version of the standard del.icio.us bookmarklet. It updates the extension I made way back in 2004. If you replace the standard del.icio.us bookmarklet with this version, you’ll still need to highlight the salient text on the page you’re bookmarking. But you won’t need to paste it into the form. It’ll pop into the Notes field automatically. Do this, and I’ll love you forever. PS: del.icio.us: Why not make this version the standard bookmarklet, and explain why? As your bookmarks increasingly find their way into our lifestreams and workstreams, useful annotations will matter more and more. The official delicious Firefox add-on puts the selected text in the Notes field automatically. And ideally you’ll put the quoted text in double quotes, to distinguish it from your own notes and comments. I have 77 delicious bookmarks on accessibility, but offering people a link to these bookmarks is useless because I never annotate them. Just the other day I watched your screencast about delicious recently and saw your copy-some-text-then-tag workflow and realized I could at least do that if I wasn’t going to take the time to write up a summary of the item. Terrific for future bookmarks! Time to pick a tag and annotate the archive. As I tweeted just now  it seems to me there should be a way of harnessing SW services in this function. So if the actor selects nothing and types nothing a default blurb is fetched and appended. Or, with someone who’s more active, perhaps as with Delicious’ list of tags that have been used, blurbs from others are offered for selection so as to gradually hone / refine a set of contexts for any item. p.s. I’m bound and determine to find a way to aggregate something like wisdom … tracking the gold nuggets back to the motherlode and engaging in the SW equivalent of hard-rock mining. Yay! I appreciate it when people annotate their bookmarks. That little bit of extra effort pays off. As Ryan Shaw pointed out above, the Firefox add-on and the IE plugin do snarf up selected text as notes (except in the Firefox add-on “classic mode”, which is basically the bookmarklet interface). This feature is in the works for the bookmarklets too, but as I understand it, there are some edge-case complications that we have to resolve first. I run Scuttle on my own server and the default bookmarklet for that app has exactly this feature in it. I always use it and find it essential. I’ve been doing this and love it when I remember to add the notes. :) I used to do this on Twitter in 140 characters but often found that limiting if not challenging. However with delicious allowing me to expand over 140, I do sometimes worry about becoming too verbose. Still, adding notes with the plugin is just so easy, so I now send my delicious feed into Twitter with Twitterfeed at a maximum rate of 3 every 30 mins and have had positive comments. I do contemplate the “level of geekiness” threshold that is twitter, while on the other hand people who follow me on delicious have encouraged that based upon what they’ve rebookmarked from me. 90% of Delicious value is the notes.